This is the story of a visitor to Box just after the opening of Box Tunnel in the village. It tells of the new properties being built to accommodate the residents of a new era, the Railway Age. But it harkens back to a slower time when ladies were required to have the ability to draw, write poetry and receive visitors at home as well as to entertain them in the correct manner. As such, the diaries that Martha kept tell of Box on the brink of modernisation. But it isn't always possible to identify the people and places that Martha refers to. That makes the story even more fascinating. Martha’s story starts prior to her arrival in Box. Her husband died unexpectedly and suddenly of cholera in 1842. Her mother died in May 1845 and in December, she took her six children, aged between six and nineteen, to France, Germany, Switzerland, Prague and Italy for their education and development. Martha had inherited a small private income from her father’s family. Martha in about 1853 photographed in a Paris portrait studio. A French governess/companion, Aurelie Hubert de Fonteny, travelled with them, and her son, Robert, had tutors and went to school. They visited galleries, socialised, sketched, and at least Martha and Clara kept diaries. Clara wrote in her diary about their visit to Paestum, Italy, one of the most historic cities with its ancient Greek-style temples. They reached it by boat, which took six hours, and when they arrived they had to walk across burning hot sand, sinking inches deep. Martha’s diaries also gave interesting social history details and they witnessed the unrest resulting from the anti-monarchist revolutions sweeping Europe in 1848. Are those dear friends who make it blest. Friendship & love are ever there. A casket full of gems to me. 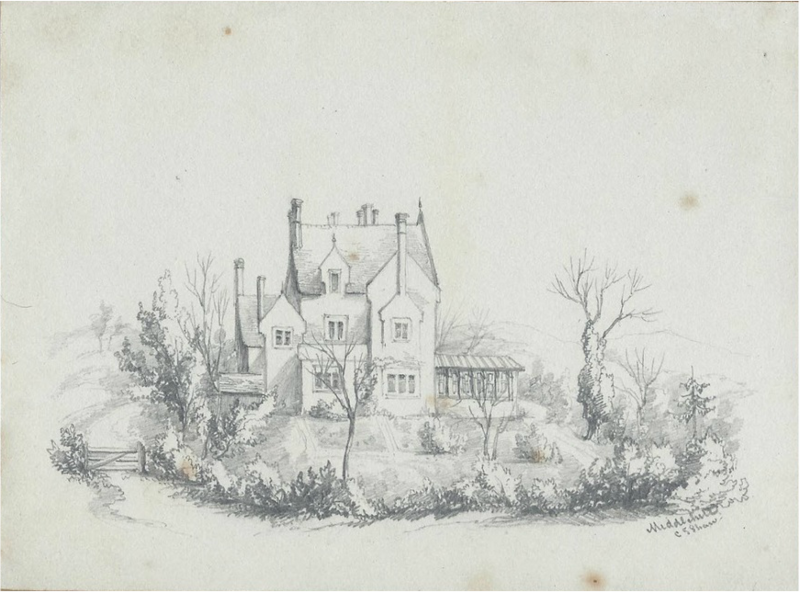 Clara Jane's illustration of an unidentified house in Middlehill. At ½ past 11 we arrive at Box and saw the Elizabethan house called Middlehill, belonging to Mr Mant, it would certainly do for us and is exceedingly pretty – the drawing room going out into a greenhouse. Dining room very pretty but small. Breakfast room. Excellent kitchens and offices. Stables. Coach house. Yard. Poultry house. 5 bedrooms on the first floor & 3 above, yet they are so situated that I know not if I could make them communicate or answer for us all. The front faces the south, there are not any windows north, the garden is very pretty, sloping all ways – pigsties, poultry house. Kitchen garden and shrubberies. Stable & coach house. Coal is 15s a ton. Meat 6d a lb. 7 minutes by rail and ¾ of an hour by road to Bath. Masters come out for same money. Excellent water – house quite dry tho’ empty all the winter. Rent £70. Taxes 15. Fixtures not to be paid for. Mrs Mant gave us a glass of wine, biscuits & homemade bread & butter, promised to stock my poultry yard. Her own hen house has a fire place in it, so that by lighting a fire every night the hens are warm & lay all the winter. They have already a brood of chickens. From Box we came straight to Keynsham but I determined not to live there because the cholera was bad and the houses are far from the church. There is a lovely place there for £80 a year (a huge sum in 1850). We had a long time to wait & then came on to Bristol, determined to come straight to Exeter in preference to stopping. Gloucester appears to be a delightful clean nice place …. & have been writing to Jane, Mrs Mant, and preparing for tomorrow’s despatches to our beloved correspondents in Paris. 24 February 1850 Cheltenham is the sort of place I cannot endure, promenades, spas, every thing for show. Letter & plan about Middlehill. After consulting Mrs Perkins (Jane was too busy) I made Fanny pack the bag & set off at 2 for Box. Jane & Mrs P., Fanny & Moley saw us off. We arrived at 7. Went to Station Inn. Sent the plans to Mr Mant. Wanted us to go to sleep. Declined. Wet bedroom. No coals. Slept on the floor! Rose from our sleeping place as early as possible. Had breakfast without milk. Went to Middlehill. It is being entirely painted. The drawing room prepared also. It looks very nice & very pretty. Mrs Mant came for us to go to Church. Walked with them. Rector preaches extempore, curate looks stern. Church very old & pretty & full of poor persons chiefly men. Went back to a good hot lunch, then to Middlehill. Looked over the house. Mrs Wiltshire arrived & her daughter – delight & kind reception. Hoisted me off to her house, introduced me to her husband. He looks 20 years older than she does. She is still very handsome & like Fanny Ness. Fine house, very complete & the very epitome of an English gentleman’s seat. Mrs Ness lives with her. Mrs Oakly is a widow with £10,000 a year ! Very charitable. Mrs W walked back with me to the house, went all over it. Could not find any damp. Fanny scamped off to order our boy down to the Mants, when we were scarcely in time for dinner. 4 March 1850 After breakfast went to Middlehill. Very well pleased. Famous underground drainage – garden stocked. Started off at 12 to get to Jane’s by dinner, determined I think to take the house. Arrived before dinner. Found everyone very glad to see us (in London). Agreement from Mr Mant. £80 a year. He to keep outside, me inside in repair. I may leave in 7 years. He may turn me out at 14 years’ end. I went to Chancery Lane with Mr Perkins after I came back. Sent off letter to Paris & Box. Signed agreement. Am now very cold writing in my room without a fire. At room all day, wrote a great many letters. John Caffany called. He is altered of course, but yet there is the same face. No letters from Paris. I am sure they are all dreadfully dull about my not going back but I think my letter today will reassure them. I am soon come to the opinion that I ought to go to Cuckfield & send my furniture. How absent it is of people to vary so & expect one to abide by all their different opinions. Mrs Mant has written to offer to take charge of my furniture. … I was up at 12 o’clock last night to pray for prosperity in temperance & spiritual things in our house in Middlehill. (Almost last entry in the diary, and no further location notes). This year of the diary contains weather notes and monthly bills, itemised, for example as, Dress for self. She lists letters received and sent. She often goes/walks twice to church on Sunday, to Box and Ditteridge. They go to Bath a lot, in a chaise, drive to Rudloe. They go to balls, pic nics. They watch cricket matches at King’s Down. They are living at Middlehill, Box. Aurelie Hubert de Fonteny, French governess and friend also there. Fanny, Laura, Clara have organ lessons at Box church. Archery competition with teas and parties. 23 February 1854: Bath happily and signed both lease and release and now I’m absolutely free of Mrs Mant, unless some accident should happen before the 25 March. Went to Freshford and Bradford. 24 February 1854: Packing all day. 1 March 1854: Pictures packed and the whole house nearly in an uproar. Packer a very quiet civil man. 4 March 1854: I was all day packing in my room neatly arranging my trinkets and other things. 7 March 1854: At Bath all day and finished by losing the only good apartment. 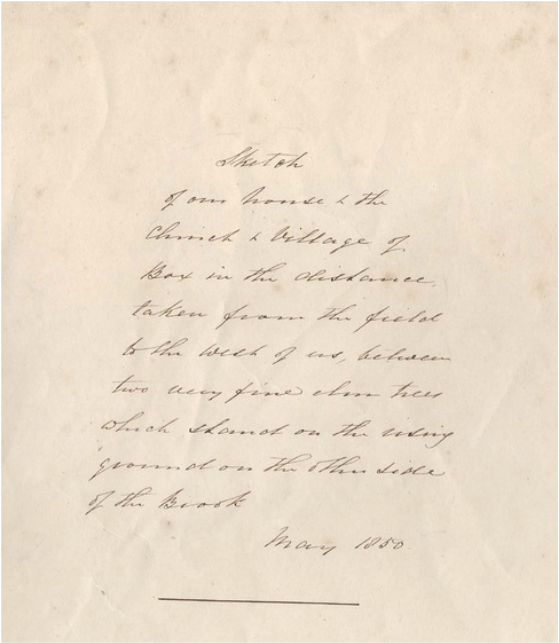 8 March 1854: Bath taken. 36 Henrietta Street. Corsham. 9 March 1854: Aurelie thrown out of the pony chaise. Our last dinner here, tho’ very painful – yet pleasing to see the regret of all for us. 10 March 1854: Tomorrow we leave Middlehill – great bustle and fatigue. Every one very kind. Emily and I dined at Holworthys, Annie and Clara at Champions. 11 March 1854: Bath at ½ past 8 train. Grand struggle over. We have now no settled house. 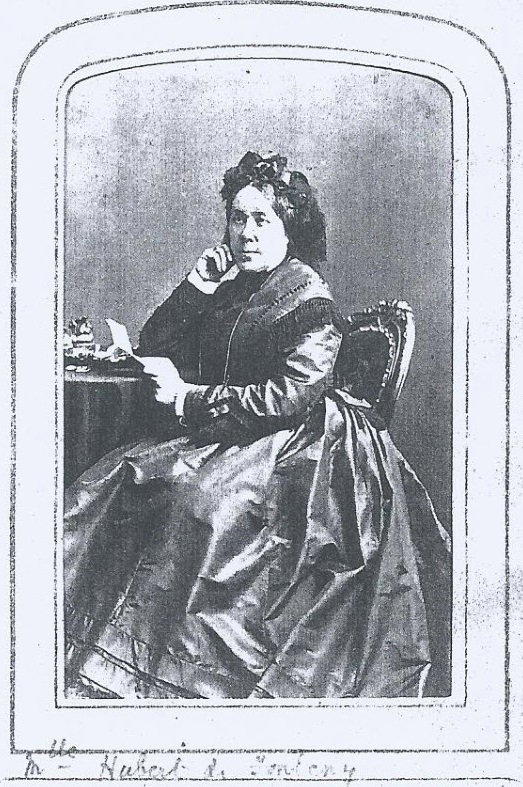 Miss Witherby, companion Martha’s Aunt Budgen. Martha's children subsequently led some interesting lives. Clara married John Younghushand, an army officer on medical leave from India, and she went to a remote area near Dharamsala in North India with him in 1856 after their marriage. The next year he survived the Indian Mutiny at Kangra Fort. Clara and her brother Robert also visited Kashmir. The British Library now holds many of Clara’s records: her European diaries and sketches, an album she compiled in memory of Robert, and an album recording her married life in India with watercolour sketches and photographs. Their son was Sir Francis Younghusband. Robert moved to North India when he was 20, for health reasons. Land was bought and he became a tea planter in a joint venture with John Younghusband. After Martha died in 1867, Robert wanted to explore, and he started to plan an expedition to open up a new trade link to sell his tea to the ruler of Kashgar. Robert and his team of local men set off in 1868 from Ladakh. After a challenging journey, he was received by the ruler and became the first Englishman to visit Yarkand and Kashgar. In 1869, Robert returned with gifts from his hosts of fine robes, boots and hats, some of which are now in the Ashmolean Museum, Oxford. He wrote about his journey in 1871 entitled Visits to High Tartary, Yarkand and Kashgar illustrated with some of his sketches. Robert was later appointed Resident in Mandalay, Burma and died there in 1879. Emily married Dr Robert Pridham Hicks, a surgeon, ex-Madras Medical Service. Fanny married Rev Frederick Augustus Baker who was vicar at Godmanstone. Annie married General Robert Romer Younghusand (brother of Clara’s husband) as his second wife. Laura married George John Robertson, solicitor in Bath, and it is Laura who is our ancestor. 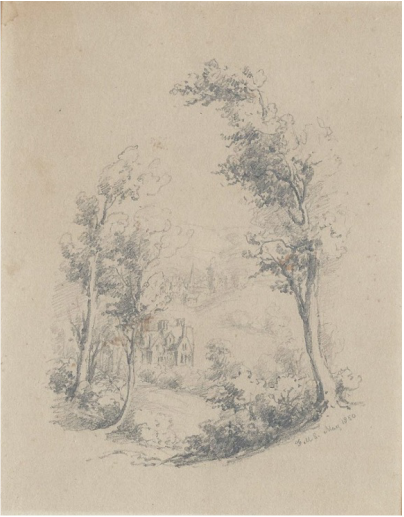 Laura produced a wonderful series of illustrations of Ditteridge Church in the 1850s, which will be included in a separate article on the website. Martha’s mother, Frances Barkley (nee Trevor) (1769-1845) was born in Bridgwater, Somerset. Her father, a clergyman, moved with his young family to Europe. When Frances was 17, living in Ostend with her father, she met Captain Charles William Barkley, ex East India Company’s sea service turned fur trader. They married a few weeks later and set sail on his ship westwards on their way to British Columbia. They arrived there in 1787 when she was 18. Frances is the first known European woman to visit British Columbia. She and Charles circumnavigated the world, taking about eight years on their voyages, visiting Hawaii, China, India, Mauritius, Russia and Alaska, and she even gave birth on board. She may be the first woman to have sailed, openly as a woman, around the world. Frances was buried, alongside her husband, at Enfield Church, Middlesex. Frances also wrote a diary, but to date its whereabouts is unknown. In her late 60s, she wrote her Reminiscences, based on her original diary. These have been incorporated into a book The Remarkable World of Frances Barkley 1769-1845 by Beth Hill and Cathy Converse. In the next issue we are going to investigate further the houses that Martha rented and the people she knew in 1850 as we try to identify the exact property they occupied at Middlehill. And Madeleine Symes reveals the story of the Robertson family of Middlehill. a. Emily married Dr Robert Pridham Hicks, surgeon, ex-Madras Medical Service. b. Frances married Rev Frederick Augustus Baker, vicar of Godmanstone. c. Anne married General Robert Romer Younghusand (brother of Clara’s husband) as his second wife. d. Clara Jane married Maj-Gen John William Younghusband (1823-1907). Gertrude (b and d 1862); Lt CSFE Younghusband (1863-1942) later Sir Francis, who married Helen A Magniac (1877-1945); and Leslie Napier (1866-1939) who married Kathleen EC Bolt (1873-1942). e. Laura married George John Robertson, solicitor in Bath. Sarah Morin Symes (b 1953) m Eital Wickremeratne (b 1930). Harriet Holworthy (18 in 1851 Census), married Commander Edward Barkley RN (1829-1909), nephew of Martha in the second quarter of 1858. He was a son of Martha’s brother Rev John Charles Barkley (who became vicar of Little Melton, Norfolk). Edward Barkley moved to Vancouver Island in 1887 and died in a house fire. The Holworthys are mentioned in Martha’s diaries. Martha’s diaries are in the British Library. Martha's European travel diaries and a souvenir album are owned by Madeleine Symes and Sarah Wickremeratne, Martha’s three times great granddaughters, through Laura Shaw.